A watch containing what is reputedly the world’s oldest whisky could sell for over £20,000 when it goes under the hammer in a Birmingham auction next month. The Louis Moinet stainless steel watch is one of 40 ever made and is entered to auction with an estimate of £12,000 to £18,000 – a price which could see the watch sell for over £20,000 including buyer’s premium. 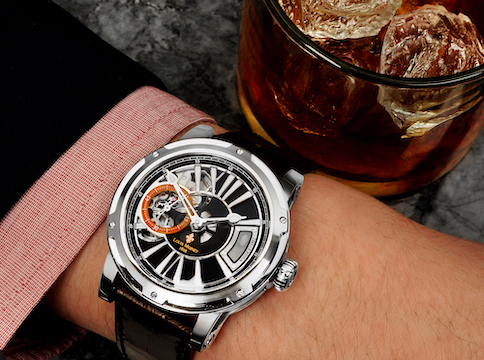 Swiss watchmaking brand Louis Moinet and Wealth Solutions collaborated to create watches containing single malt whisky reputed to be the oldest in the world. They made just forty pieces in steel and only ten in gold. The historic whisky, dating back to 1862 and the age of steam, was distilled in Glenlivet, amongst the beautiful Scottish hills. The whisky capsule is placed on the 3 o’clock mark, and it complements the beautifully designed watch offering a taste of 19th-century Scottish life. Auction house Fellows has previously sold watches containing the world’s oldest rum for over £30,000.